Comparative transcriptomics of limb regeneration: Identification of conserved expression changes among three species of Ambystoma. Title Comparative transcriptomics of limb regeneration: Identification of conserved expression changes among three species of Ambystoma. 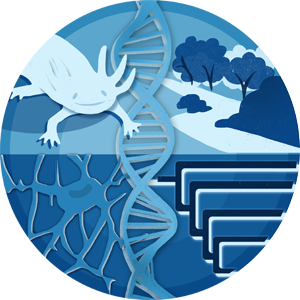 Transcriptome studies are revealing the complex gene expression basis of limb regeneration in the primary salamander model - Ambystoma mexicanum (axolotl). To better understand this complexity, there is need to extend analyses to additional salamander species. Using microarray and RNA-Seq, we performed a comparative transcriptomic study using A. mexicanum and two other ambystomatid salamanders: A. andersoni, and A. maculatum. Salamanders were administered forelimb amputations and RNA was isolated and analyzed to identify 405 non-redundant genes that were commonly, differentially expressed 24 h post amputation. Many of the upregulated genes are predicted to function in wound healing and developmental processes, while many of the downregulated genes are typically expressed in muscle. The conserved transcriptional changes identified in this study provide a high-confidence dataset for identifying factors that simultaneous orchestrate wound healing and regeneration processes in response to injury, and more generally for identifying genes that are essential for salamander limb regeneration.